his area of the curriculum is designed to invite the young learner to act and work on real life tasks that foster independence, coordination, order and concentration. It is in a sense the doorway to the Montessori curriculum. This is the area where the child may first choose independent work. The practical life area contains many attractively displayed objects familiar to the child, including a variety of items commonly used in the tasks of daily living, like eating, dressing and cleaning. They offer the child meaningful, non-threatening modes of activity. The materials are also carefully designed and demonstrated to help teach skills involved with caring for the environment and the self, to encourage responsibility, autonomy and to promote high self-esteem. Dr. Montessori saw the senses as the "doorway to the mind". She considered sensory and manipulation not only an aid to the development of maturing sense organs (eyes, ears, nose, tongue and skin) but a starting point for the intellectual growth. She believed that by helping children to order, compare and classify sensory stimulation, their intellectual development would be greatly assisted and future learning would be more meaningful and useful. The basic sensorial exercise inspires careful observation and calls attention to specific qualities requiring identification of similarities and contrasts. The mind must judge, compare, classify and draw conclusions. These exercises tend to fascinate children because they are difficult enough to represent a real and meaningful challenge. They are then better prepared for future learning in math, language, and science and making sense of life's experiences and information in general. Language development is a concern of the entire Montessori classroom. Many activities in other areas, as well as with a large group, foster vocabulary development, communication skills, writing and reading readiness. In the language area, we will find a large variety of reading readiness materials, including materials for phonetic analysis, word attack skills and reading, as well as materials for the refinement of motor control for writing. In the Montessori Method, writing precedes reading, as the children explore with drawing and forming letters. The process of learning how to read should be as painless and simple as learning how to speak. The child begins by exploring the sounds that compose words and by relating them to the letters of the alphabet. He can soon produce words and sentences free of all other mechanical difficulties. In the meantime, he trains his hand to become precise and sure for the writing movements. Reading is prepared indirectly from writing. The child starts from what he knows about the letters and the sounds. Then we give him the key to read all the words he can encounter. Reading skills normally develop so smoothly in Montessori classrooms that students tend to exhibit a sudden "reading explosion" which leaves the children and their families beaming with pride. Dr. Montessori's research confirmed what observant parents have always known: children learn best by touch and manipulation, not by repeating what they are told. Her manipulative approach to teaching children how to read phonetically is nothing short of brilliance and should have long ago become a basic element on every early-childhood classroom around the world. The central purpose of the Math materials in the early years is to lay the foundation for later cognitive development and to prepare for the gradual transition to abstract thinking. Many children enter school today knowing how to count but may not have an understanding of quantity of numbers. They merely may have only memorized numbers. When a child indicates that they are interested, we begin to demonstrate to them how to count using concrete, mathematical materials and later introducing the abstract symbol for numbers. Eventually, through the use of our specially designed mathematical materials our children learn about the decimal system, the process of addition, subtraction, multiplication and division. The children will begin to work out math problems on paper. As they begin this abstract process, they will not require the use of the concrete materials as necessary. At this time the child can visualize consciously that the process of addition is "putting things together", and subtraction is "taking things away". With continual practice, the understanding of abstraction begins to take hold. With time, this understanding of abstraction begins to take hold. Later on, when our children enter the elementary program either in a public school/private school or in a Montessori School, they will have a thorough understanding of what numbers mean and will be able to comprehend the mathematical facts and abstractions presented to them. 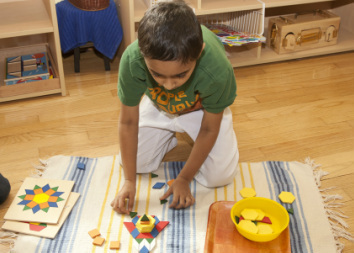 The Montessori math curriculum is based on the European tradition of "Unified Math," which has only recently been recognized by leading American educators. Unified Math introduces elementary students to the study of the fundamentals of algebra, geometry, logic and statistics along with the principle of arithmetic. This study continues over the years, weaving together subjects that traditional schools normally ignore until the secondary grades. Our teachers introduce geography and history as early as age three. Children love to play with puzzles! We have large, brightly colored wooden geography puzzles. Each has a map to a particular continent, where children learn to reassemble the pieces, representing the individual countries. They can all learn the countries of Europe, Asia, Africa, North America, South America and Australia. Families are often invited to share their customs, lifestyles, music, art and food with the classroom community. Later in elementary school, the students see the world's cultures in greater depth. They learn to treasure the richness of their own cultural heritage and those of their friends. Science is an integral element of the Montessori curriculum. Among other things, it represents a way of life: a clear thinking approach to gathering information and problem solving. The scope of the Montessori science curriculum includes a sound introduction to botany, zoology, chemistry, physics, geology and astronomy. The Montessori approach to science cultivates children's fascination with the universe and helps them develop a lifelong interest in observing nature and discovering more about the world in which we live. An increasing number of people in the world are utilizing Spanish as their first language. Included in those numbers are many of our own citizens and also those emerging nations, which lie just south of our borders. The objective of our Spanish curriculum is to introduce our children to this increasingly predominant language. This will enrich their understanding of language in general, and we believe that this exposure to and usage of the Spanish language gives our children tools in which will help them to succeed in their future endeavors. The purpose of the Spanish program is to introduce students to a new language and culture, and to start develop communicative skills. The content includes developing skills in two major program areas: listening and speaking. At each level of learning, a student will work towards an increased proficiency in each of these two areas. Music and movement education will also be important parts of the curriculum as well as the Arts. 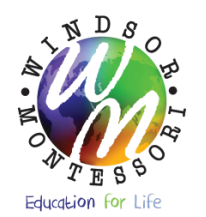 Windsor Montessori is very interested in helping children develop control of their fine and gross-motor movement and we feel arts must be as meaningful a part of the curriculum as mathematics and language are. We advocate teaching the arts because they provide children with a sense of civilization, they foster creativity, they teach effective communication and they provide tools for the critical assessment of what one sees, hears, feels, reads and experiences. Music represents the first formal experiences for the child. Emphasis will be on the development of the child's voice, singing in tune, and responding physically to music. Children will be encouraged to participate at their own level. An effective Art Curriculum provides a sequential program of instruction for all students beginning in kindergarten and continuing through lower and upper elementary in preparation for higher education. Every student deserves to learn about our common artistic heritage and develop a chance to add creative images to the world, expressing ideas and emotions that cannot happen with language alone. Students should also recognize how art interrelates to other curriculum areas and how world cultures have been shaped and influenced by the arts. Students should develop methods to evaluate the success and effectiveness of their own work, becoming responsible critics, and understand ways in which the arts contribute to contemporary life.Art should encourage curiosity and exploration of the basics, including reading and writing about artists as part of the other curriculum areas (e.g., history, social sciences, language, and math). 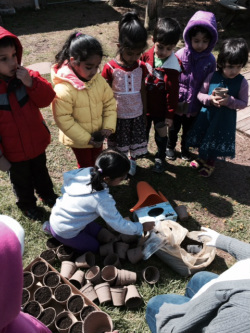 Nature study gives the child an opportunity to explore their natural world. Our curriculum incorporates Montessori’s philosophy of teaching the child about nature and the connection of all living things. We feel children should learn and interact with nature to appreciate its wonders as they secure their place in the world. Playing outside gives children the opportunity to problem-solve and experience their environment in a logical way adding to their ability to be self-reliant. They also learn about their responsibility as caretakers of their environment. We will work with topics in Plant and Animals, Life Cycles, Gardening, Harvesting, Composting, Weather, and Environment.